Fall Color: Varied but usually shades of yellow and brown. 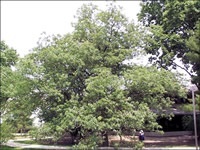 Usually grows to medium sized tree in Iowa and is sporadically found. Leaves are toothed and not lobed like other oaks. Acorns are smaller than most oaks. Bark is thin like the white oak. Strong tree, good for wildlife food and windbreaks.